224 Pages, Trade Paperback - 6" x 9"
Storybase publisher and co-creator Thomas B. Sawyer is a novelist, screenwriter, playwright. Head Writer/Producer-Showrunner of the hit CBS series, Murder, She Wrote, for which he wrote 24 episodes, Tom has written 9 network TV series pilots, 100 episodes, and served as Story Editor, Producer or Showrunner on staff of 15 network series. He is co-librettist/lyricist of Jack, an opera about JFK that has been performed to acclaim in the US and Europe. He wrote, directed & produced the cult film comedy, Alice Goodbody. The best-selling mystery/thriller, The Sixteenth Man, is his first novel. His next thriller, No Place To Run, will be published in 2007. Emmy and Edgar-nominated, Mr. Sawyer has taught writing at UCLA, at other colleges and universities, and teaches at numerous major writers conferences. 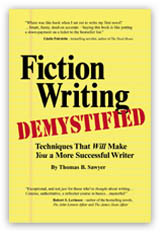 Both his latest book, Fiction Writing Demystified, and Storybase, are Writer’s Digest Book Club Selections. Written in clear, direct, take-'em-to-the-bank nuggets, Fiction Writing Demystified is the only how-to book on the subject written by a truly successful fiction writer. "Absolutely devoured your book! Pages folded back, underlinings, margin notes... A treasure trove, brother. Fabulous. " "The best technique book I've seen. A here's-how-you-do-it book...fun...reads like a workshop, with Tom rolling breathlessly and enthusiastically from topic to topic. I began using it the day I got it. " "Where was this book when I set out to write my first novel? ...Smart, funny, dead-on accurate -- buying this book is like putting a down payment on a ticket to the bestseller list." "Exceptional, and not just for those who've thought about writing.... Concise, authoritative, a refresher course in basics... masterful!" ".Really wonderful.the most specific and helpful I've ever read - not only for the beginner but for the experienced writer." "Sawyer's analysis of the craft and observations on the process are not only true, they're universal. If you use only half of what's in this book, your writing will be twice as good!"